In the Los Angeles and Orange County area, the cost of a 1cc syringe of Juvederm can range between $450 and $1000. Why such a huge range? The Juvederm family of products consists of three different lines: Juvederm Voluma XC, Juvederm Ultra XC, and Juvederm XC. Each of these lines has it’s own special HA particle size and gel consistency that make each one a good match for a particular problem area. For instance, Juvederm Voluma XC is better for cheeks and temples, whereas Juvederm XC is better for lips. Because of this, you will most likely need to have your lips injected more frequently than your cheeks or temples. We’ve found that the average cost is usually around $500-$750 for Juvederm products. Juvederm Voluma XC is the most expensive and Juvederm XC is the least. Remember too, the cost of a syringe of Juvederm also includes the skill of the injector holding that syringe! Creating a plan for your treatment with Juvederm takes an artful eye as well as knowledge of anatomy and aesthetic standards. These talents take a long time to master and experience and training matter! Also consider the value of knowing that you are in the most capable and talented hands. At Celibre Medical, our injectors are experts at using Juvederm products. We value your trust and want to work with you to make a treatment plan to help you reach your goals. We pride ourselves on delivering results that not only meet your expectations, but exceed them! Please give us a call today! 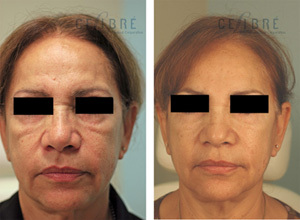 Contact Celibre today for your FREE juvederm injections consultation!